What's your favorite casting from childhood? Nice write-up over at Diecast Motorsports about the Dixie Challenger. Been 35 years since it was released, apparently there's an anniversary release that's all chrome. 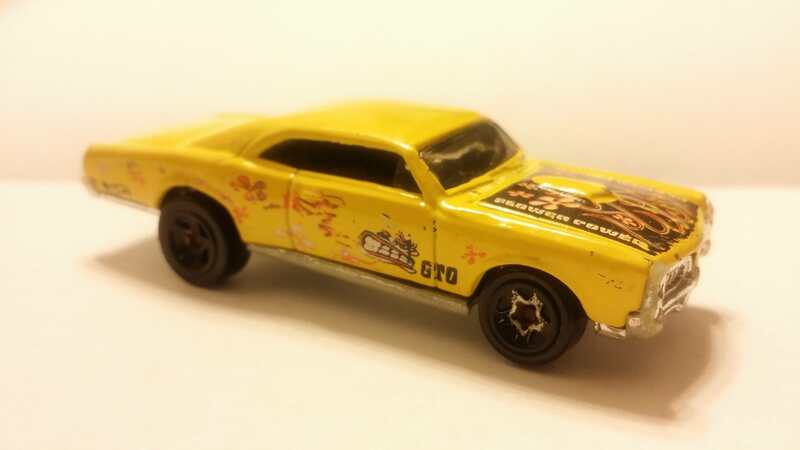 The Dixie Challenger has a pretty special place in my heart (despite any controversy) because it was one of the cars that came with what was quite possibly the first Hot Wheels set I got as a kid. And at the time I was also dining daily on Dukes of Hazzard so it was an intersection between two things I loved at the time. The Duke Boys might not hold up so well anymore, but the cars certainly do. 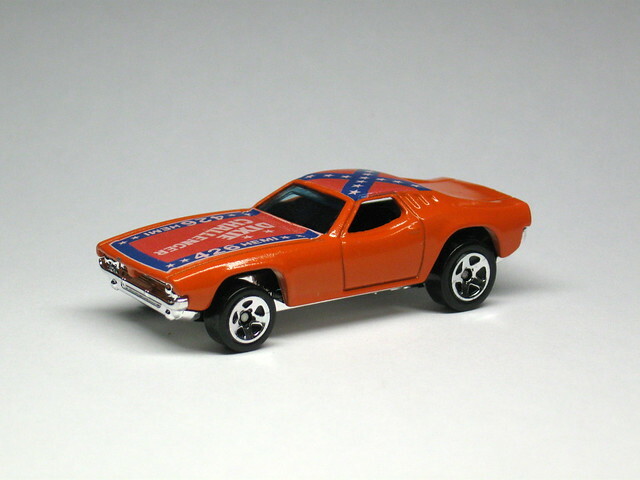 One of the first customs I made when I got back into Hot Wheels was remaking the Dixie Challenger. I bought some repro decals and slapped them on a 2008-ish release of the Challenger. Not bad for a first time trying to "nicely" paint a Hot Wheels. A little orange goes a long way. Wow! This is so cool. Thank you for sharing your story. Its always cool to hear how certain people relate to certain vehicles. The Purple Roger Dodger was one of my favorite cars when I was a kid! That chrome Dixie is super sharp Brian. I have to say that if that's your dad in the photo, he was really rockin' that stache! Chris, is this the car? Smokey and the Bandit was one of my all time favorite movies growing up. While on vacation with my folks, I found this beauty in a department store -it came in a three pack along with a white '57 T-Bird and grey Jaguar XJS. The Hot Bird was my fasted Hot Wheel for quite a while -life was good in the 70's. Born in 67, father owned a Ford dealership, so I loved the Mustangs....Spoiler Series...Boss Hoss. I also loved the Red Baron casting and had the one with the white interior. 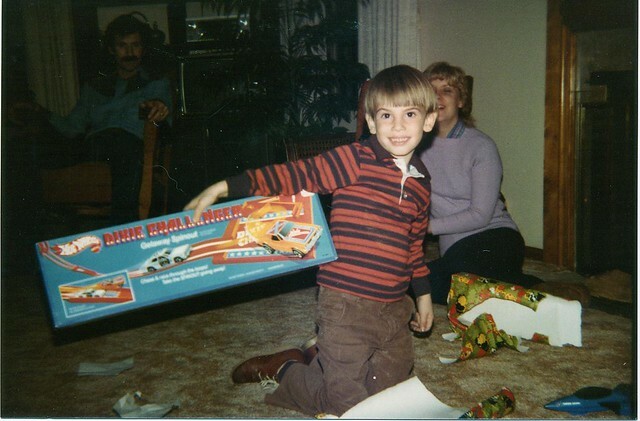 I will tell the horror story of what became of my childhood Hot Wheels collection some time...it's brutal and not for the faint of heart. I promised to tell the Horror Story...and I'm a Man of my word.....and I truthfully still have nightmares about this day from time to time. ....it was the winter of 1978....I was 11 years old....my best-friend at the time and my next door neighbor of 10 years old was present....there was snow on the ground...a good bit here in North Carolina to facilitate a "snow day"....there was a raging fire in our Den of our two story house on this auspicious day in 1978, and by this time my friend and I were totally into slot car racing....had a huge set-up in the Den we are speaking of now...many neighborhood kids brought their slot cars to race on our combined "Grand Prix" set-up. So, we decided to set-up this "super-cool" jump set-up into the fire place of this raging fire in 1978.....and since Hot Wheels had taken a back seat to this new very cool avenue of slot car racing...we preceded to jump our Hot Wheels into the raging fire and watch gleefully as they turned into unrecognizable slag. I remember the cars we both had total...they were still in primo shape because we did care for them until this fateful day....some were original Redlines and soon thereafter castings.....now armed with adult knowledge...a love for the hobby and research into today's worth.....I'd say $20,000 was easily turned to slag that fateful day in todays market in 1978.....that is my Horror Story and it Haunts me to this very day. Ha, yup! Same thing happened to my cars some 10 years after your bloody day. My Hot Wheels met up with cinderblocks, an M80 or two and a big hole in the backyard. Funny how toys meet destructive ends. I remember setting a lot of GI Joes and even Star Wars figures on fire and watching them burn at the stake. Between the figures and Hot Wheels, I don't even want to know how much "value" was lost...but I don't regret a minute of it. Toys are meant to be played with, and boy were they! When I was growing up in the `70s, I remember how the S'Cool Bus was probably the most coveted with the Pit Crew car coming in a close 2nd. They weren't my absolute favorites, however. The one car in my childhood collection that always had to most "miles" on it was the Paddy Wagon. I liked the 'Old time' style of it and it was usually very consistent on the track. I remember that it could negotiate jumps rather well, having a good attitude while in the air and landing perfectly almost every time. It was also the first regular HW car that I ever rolled on Fat Track. I, too, eventually moved on to slot cars. The original HW collection was sold at a yard sale @ $.25/car. I recall selling the entire collection to a grandmother who bought them for her grandkids. The total price came to $12(case included), which I was thrilled to get at the time because that's how much a single AFX G-Plus car cost in the mid-70s. Back when I was 12-13 years old ('66-67) I was into building model cars. Got into slots for a short time but the models won out. I only started collecting in 2001, but if I had a favorite it would have been the Twin Mill. I don't know when it came out, but it's one of my most favorite castings. With the Pontiac GTO being my first Hot Wheels car, it is my favorite childhood casting.